Early morning view across the rough terrain of the Lower Pecos, a land of plunging canyons, blue skies and scenic vistas. Photo from ANRA-NPS Archives at TARL. Thousands of years of intermittent human occupation can be seen in the walls of this incredibly deep archeological excavation at Arenosa Shelter. 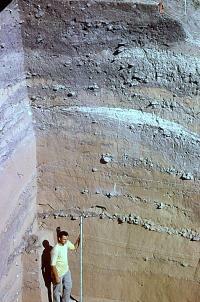 Because this site is located on a low terrace of the Pecos River, periodic floods left behind thick deposits of tan silt. Between the major floods are equally thick gray, ashy midden deposits created by prehistoric peoples. This early morning photo brings out colors often muted by the intense sun. This 1966 photograph from the ANRA-NPS Archives at TARL was probably taken by Dave Dibble; the young archeologist holding the stadia rod is Mark Parsons. The jagged canyonlands they called home contain an extraordinarily rich cultural legacy of ordinary and extraordinary things that are rarely found in most other areas of North America. 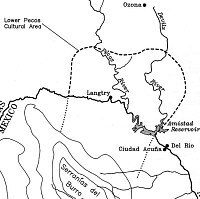 The approximate area of the Lower Pecos archeological region as defined by archeologist Solveig Turpin. 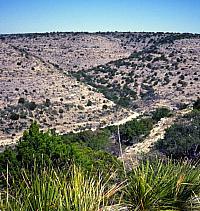 The southern limit is not precisely known, but believed to be in the Burro Mountains in Coahuila. The Pecos River gives the Lower Pecos its name and provided natural shelter in hundreds of rockshelters along its canyon walls and those of its many side canyons. Photo from ANRA-NPS Archives at TARL. 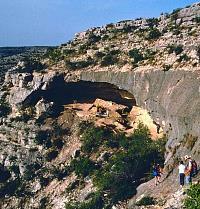 Archeologists carefully make their way across a steep rock slope to join the excavations at Baker Cave, a large occupation shelter located in a side canyon of the Devils River. Photo by Tom Hester. 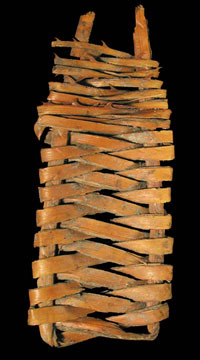 Miniature netted pack frame perhaps used by a child. From the ANRA-NPS collections at TARL. View of the lower Devils River valley now partially filled by Amistad Reservoir. In prehistoric times, the wider terraces along this stretch of the river were shaded by massive oak trees and were a favored camping spot. Photo by Steve Black. Spectacular view of one of the large side canyons of the Rio Grande. These create sheltered environments with a concentration of water, plants, animals, and, in prehistoric times, people. Photo by Steve Black. The Lower Pecos Canyonlands is one of the most distinctive and significant archeological regions in Texas and, indeed, in North America. It is not that the Indians who once lived here were particularly important or unusualthey were just ordinary folk like many others all across the prehistoric landscape. But due to a unique combination of ecological and geological factors, the jagged canyonlands they called home contain an exceptionally rich cultural legacy of ordinary and extraordinary things that are rarely found in most other areas of North Americaperfectly preserved food remains, vivid rock art over 4,000 years old, grass-lined beds, painted deer bones, and much more. By studying these things and the places where they are found, researchers from many disciplinesarcheologists, anthropologists, biologists, art historians, paleontologists, geologists, and othersare piecing together a remarkably detailed understanding of the human and natural past. Although the Lower Pecos Canyonlands contains a uniquely vital cultural legacy of worldwide importance, many Texans don't even know it exists. Sadly, among those who do are some who rip apart its caves out of greed and stupidity and crudely carve their names on ancient works of art. Those who explore this exhibit will understand how senseless and tragic these thoughtless actions are. Perhaps as more people appreciate what can be learned about the cultural heritage of Texas in this unparalleled place, the sites that remain unharmed will be protected for the future. This exhibit provides an overview of the Lower Pecos Canyolands and introduces some of the places and topics that are explored in greater depth in three other companion exhibits on this website. A special exhibit—Ethnobotany of the Lower Pecos Canyonlands—details the many ways that native peoples made use of the region's wild plants. Major exhibits on two of the most amazing and best known archeological sites in the Lower PecosBonfire Shelter and Hinds Cave illustrate what can be and has been learned by thoughtful study. Here we choose to use the evocative term "Lower Pecos Canyonlands" or simply the "Lower Pecos" instead of the technical term often favored by archeologists: the "Lower Pecos archeological region." Archeological regions (sometimes called "cultural areas") are geographic areas that are distinct in the minds of archeologists because of the similarities they observe in culture, artifacts, geography, climate, and other interwoven factors. In some areas of the state, archeological regions are very broad and cover many hundreds of square milesthe Caddo area, for example, covers much of northeast Texas and adjacent areas of neighboring states (see Caddo Map Tool). In contrast, the Lower Pecos Canyonlands covers a much smaller territorythe area surrounding the junctions of the Pecos and Devils Rivers with the Rio Grande just upstream from Del Rio, Texas. Although the best-known part of this area lies in Texas, the archeological region extends southward into northern Coahuila, Mexico. The three rivers and their many tributaries form deeply incised canyons within which numerous rockshelters occur. Although the region is arid, averaging less than 15 inches of rain per year, the rivers as well as springs and temporary waterholes called tinajas within the smaller canyons provided reliable water sources. For over 13,000 years prehistoric hunter-gatherers lived in the region, sometimes occupying the rockshelters. The generally dry conditions coupled with the protected rockshelters resulted in the preservation of fragile materials such as wooden artifacts, woven sandals, and plant food refuse that decay quickly in most other areas of Texas. But the most spectacular and defining archeological phenomenon in the Lower Pecos Canyonlands is the vivid rock art that adorns the protected walls of many of the rockshelters. 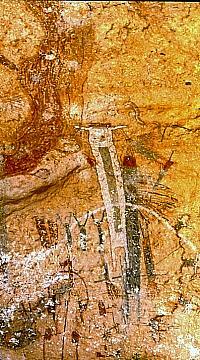 The red, black, white, and yellow images created by hunter-gatherers in the Lower Pecos beginning as early as 5,500 years ago are among the best preserved examples of rock art anywhere in the world. The art and archeology of the region is truly world class, providing archeologists with the opportunity to study the remains of prehistoric gathering and hunting cultures in far greater detail than is possible elsewhere in Texas and in much of the world. The Natural World of the Lower Pecos Canyonlands is a curious place where permanent sources of water can be found a short walk from an arid landscape that may wait months or even years between periods of adequate rain. Each of the riversthe Pecos, the Rio Grande, and the Devilsoriginate beyond, sometimes far, far, beyond the region, giving each a distinct character. Yet the rivers and their tributaries form narrow ribbons of oasis-like abundance that twist and turn through the rocky and often waterless limestone terrain of the canyonlands. Many of the plants and animals found here are at the outward limits of their distributionsthe Lower Pecos lies at the intersection of ecological zones stretching north, east, south, and west. Most of the evidence we have about the human past in the Lower Pecos Canyonlands comes from Rockshelters, natural shelters large and small that occur in great numbers within the rocky canyonlands of the region. Although it might seem that way, the prehistoric inhabitants of the region did not spend most of their lives in rockshelters. They lived throughout the canyons and high above in the uplands where grasslands once thrived. But, the rockshelters provided refuge during times of harsh weather and, more importantly for archeologists, the rockshelters protected the fragile remains left by prehistoric peoples from the ravages of time. Above all else, the Rock Art of the Lower Pecos Canyonlands is its most distinctive and defining feature. The rockshelters and other protected rock surfaces provided the canvases upon which prehistoric and early historic-period Indian artists created some of the world's most remarkable "primitive art." While the cultures that produced the paintings and carvings may be considered primitive at least in a technological sense, the rock art is incredibly sophisticated and complex. Hundreds of different motifs and symbols occur representing at least four major styles, the earliest and best known of which, the Pecos River style, began perhaps 5,000 to 6,000 years ago. 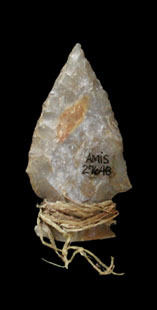 The hunting and gathering Economy of the prehistoric peoples of the Lower Pecos Canyonlands can be studied in great detail due to the extraordinary preservation conditions. During most periods, plant gathering played a far more important role in the day-to-day diet than did hunting. While deer and buffalo were hunted whenever present, most game was rabbit-sized and smaller. Two mainstay plants were lechugilla and sotol, two tough desert plants that have hearts (leaf bases) that are edible, but only after prolonged cooking. Such plants may not have been considered very desirable because they require an extraordinary amount of labor relative to the food yield. The fact that these plants were so important to the economy shows how difficult life could be, especially during droughts and other times of stress when few options were available. Archeological excavations at more than a dozen rockshelters in the Lower Pecos Canyonlands have uncovered all sorts of Everyday, Extraordinary Thingstrash, tools, food remains, medicine bundles, clothing and more. 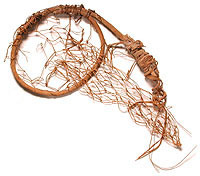 While many of these would have been ordinary, everyday things in the lives of the prehistoric Indians of the region, they are quite extraordinary in a different way. Most of them are made of fragile organic materialswood and fiberthat are quickly destroyed through the passage of time in most places in Texas. Only in dry protected places (or in permanently waterlogged circumstances) are such everyday things preserved. 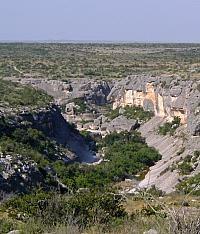 Due to its unique setting, the Lower Pecos has yielded a wealth of such things and they shed much light on the prehistoric past. Ironically, the Archeology of Lower Pecos Canyonlands is less developed than that of many other areas of Texas despite its obvious importance and potential. To be sure, much has been learned, but there is still a great deal more research that is needed including further digging and further study of the evidence that already has been recovered. The first archeological expeditions in the 1930s were mounted by museums intent on gaining fascinating materials for display. It was not until the late 1950s and early 1960s that serious research began, most of it prompted by the construction of a huge dam on the Rio Grande that flooded out the lower canyons of the Devils and Pecos Rivers. 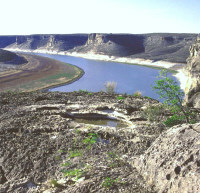 The Before Amistad section tells the story of the archeological and paleoenviromental research that took place in advance of the completion of Amistad Reservoir. This international reservior occuppies the core area of the Lower Pecos Canyonlands. The fieldwork began in 1958 and continued until 1969 when the lake began to fill. The analyses and reporting continued into the 1970s and the collections and information from the Amistad research continue to be studied today. In Credits and Sources you will find references to some of the major studies on the Lower Pecos Canyonlands and links to other online sources of information. Better still, you can visit the region and see for yourself some of the rockshelters and rock art protected in national, state, and private parks, and preserves. The cave paintings and the remarkably well preserved cultural record of the Lower Pecos Canyonlands are matched by few places on earth. White Shaman Cave contains one of the most famous and celebrated pictographic panels featuring a large anthropomorphic (human-like) figure in white that is often interpreted as a shaman in the midst of an otherworldly experience. Photo by Steve Black. Oasis-like bands of green vegetation along the canyon floors stand in contrast to the dry rocky uplands. Different sets of plants and animals can be found in both canyon and upland environments, a fact that prehistoric peoples used to their advantage. Photo from ANRA-NPS Archives at TARL. Sandals woven from the strong fibers of desert plants can survive for thousands of years in the dry cave deposits typical of the Lower Pecos Canyonlands. From the ANRA-NPS collections at TARL. 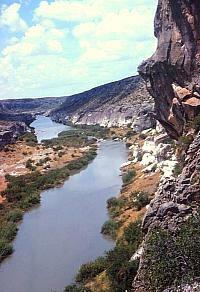 Although archeologists first visited the Lower Pecos in the 1920s and 1930s, systematic work did not begin until 1958. 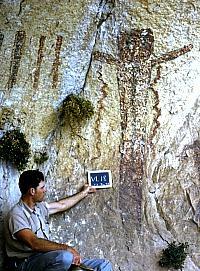 In this scene an archeologist holds up a chalk board reading (in part) VL 18, a temporary designation during the early phases of the survey work. Photo from ANRA-NPS Archives at TARL. Archaic dart point with fiber bindings still attached. From the ANRA-NPS collections at TARL. 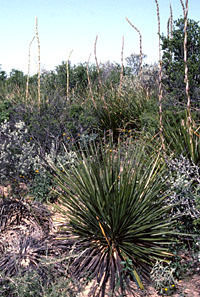 Sotol and other desert plants growing in the uplands of the Lower Pecos Canyonlands were used in many ways. Dried sotol flower stalks were used as firewood and for tool-making, the thorn-lined fibrous leaves were stripped and used to weave sandals, and the hearts of the plant were baked for days and turned to sugary carbohydrate. Photo by Steve Black.